Sadly, we suffered a break-in earlier in December. It was an interesting experience that I learned a lot from. Most surprisingly is that I wasn’t angry that we had a break-in, more disappointed. Some of the things I did to prevent or minimize the damage of a break-in worked, and other things didn’t. From my perspective, it was only a matter of time before we were targeted. The city of Seattle has a real problem with burglary, from January-August of 2013, burglary rates are up 23% already. Bring up the subject at a party and everyone there will either have been a victim or will know multiple victims. It’s a fact of life if you live in the city. If you think you know who she is, send me an e-mail at koz <at> kozknowshomes.com. I came home around 7:00 PM. As soon as I got home, I knew something was wrong because of the noises coming from the house. Ransacking is a very distinct sound! Instead of doing the obvious thing and calling the police immediately, I opened the front door. Once I opened the door, I was sure there were people in the house and I called the police. To their credit, Seattle PD arrived within 5 minutes, but the burglars heard me place the call and ran out of the house before the police got to the house. Thankfully, they took off without actually taking anything. 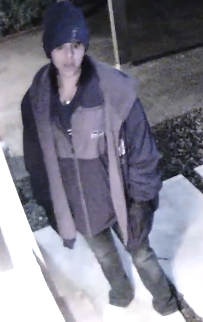 After looking at the camera footage, it was clear that the burglars were in the house for maybe 5-6 minutes (certainly less than 10). The burglars got in via the door in the basement and went straight to our bedroom, in the few minutes they were in the house, they caused about $1,000 in damage. They damaged my gate, broke the window in the back door, toppled a dresser and broke a shelf in my closet. They had filled a laundry basket with “loot”, where “loot” is a euphemism for costume jewelry and an old xbox. My guess is the items in the basket would pawn for less than $300. I’d taken some steps to make my house a less attractive target, I covered some of these actions in a previous blog posts. Some of these worked, others didn’t. This is a no brainer, we don’t keep anything of “real” value in our house, the important documents and what little extra-fancy jewelry we have, we keep in a safe deposit box. If you want to keep these things at home, then get a safe. If you get a safe, MAKE SURE YOU BOLT IT TO THE WALL OR FLOOR. A safe doesn’t do you any good if the bad guy can walk off with it. Keep in mind, cameras are not prevention. Let’s repeat that just to be clear: cameras are not prevention. What the cameras did do for me was create evidence that I then gave to the police. They were very interested in the footage. The cameras also did a great job in letting my wife and I see exactly what kind of criminal was targeting us. It’s clear from the video that these aren’t exactly high end cat burglars but instead people who randomly picked our house. If you look at the first few seconds of the video, you realize that the woman scoped a neighbors house while the man scoped ours. If she had been a little bit faster with screening my neighbors, we may not have been hit at all. Being able to see this was really good, particularly for the Mrs., she was MUCH calmer about the incident after seeing the video. I had installed keyed gate locks to my gates thinking that this would deter theft as the bad guy wouldn’t be able to get into the back yard. This was naive on my part, instead of deterring the thieves, they broke through my gate. If I’m going to keep my gates locked going forward, I’ll have to reinforce the gates so that they can’t be broken so easily. Repairing the gate was a few hundred dollars. I don’t believe in the effectiveness of alarm systems for deterring theft, I figured anyone who would be deterred by the alarm system would be deterred by the sign too. I purchased a genuine alarm system sign off of eBay. It didn’t matter. You can tell from the video that the front of my house is very well lit, my backyard is also well lit by a high intensity LED flood light. None of the lighting deterred the thieves, they ripped the light off the wall in the backyard, which was another few hundred to fix. Oddly enough, my neighbor’s house is completely black and they skipped right past it, go figure. I had put in a new back door, with an elevated dead bolt so that you couldn’t reach it through the dog door. I also mounted the door so that it opened outwards to prevent people from being able to kick it in. What I hadn’t done (yet) was reinforce the window in the door, Bonnie and Clyde threw a paver through the window. This cost me $350 and a full day of vacuuming, we’re still finding bits of tempered glass in the house. I heard the sounds as soon as I opened the door to my car. I *should* have called the police at that moment and put distance between me and them. Instead, like an idiot, I opened the front door and peaked in. Thankfully I didn’t get hurt and they took off when they heard my voice, but I had no idea if they were dangerous or not. There are two main changes I’ve made since the break-in. I replaced the glass in the back door with double pane, double laminate glass. This is similar to the glass in a car windshield, instead of shattering into a million pieces (like tempered glass), it’ll “spider” because the layer of plastic between the glass will keep the glass together. Throwing a brick at this will break the glass but not allow entry to the home. Even if the bad guy gets through the first pane, they will have to get through a second pane. I’ve also installed an alarm system. To be clear, I don’t think an alarm system will stop a break in. What an alarm will do, is prevent my wife or I from walking in on a crime in progress. I also think the alarm will limit the amount of time the burglars can spend in the house and protect us while we’re not in town. There are some other advantages that aren’t security related that I’ll talk about in a future blog post about the alarm system I chose.